Honda Motor Company Ltd are a Japanese automaker that you have almost certainly heard of. The company is an absolute giant and currently boasts titles like the worlds largest motorcycle manufacturer and the worlds leading combustion engine manufacturer. A little known fact about Honda is that they actually unveiled the worlds first four-wheel dive car – the Honda Prelude. The model names are actually quite meaningful with examples like the Civic being named for the hustle and bustle of city living and provoking thoughts of crowds and tall buildings, while the Accord is named to represent the harmony between drivers and their cars. Constantly investing in new ideas and technology, Honda have demonstrated the fruit of these endeavours with productions like the ground breaking Asimo Robot and the HA-420 HondaJet, which is due to be FAA Certified in 2015. The Japanese company made a huge investment in 2013 when they put around 5.7% of its revenue ($6.8 Billion) into research and development, which means the Hondas of the future will be even more advanced and efficient than their already prominent line-up. As a Honda owner, make sure you protect yourself with a Honda car warranty from Warrantywise. We guarantee not to be beaten on price and cover for any Honda car warranty. 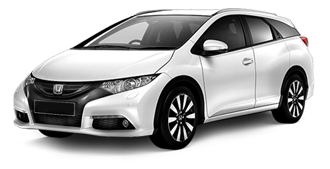 The Honda Civic is an instantly recognisable high end hatch back. It took the country by storm with its eye catching bodywork and excellent practicality. The interior of the Civic is classy with plenty of soft touch materials. Performance is also very good and if you have a type R you will leave most other hot hatches in your dust. The Honda CRV is a smooth looking SUV designed for tarmac rather than the dirt track. Space is abundant both in the boot and in the cabin for passengers. Storage space is also plentiful and the interior feels crisp and clean. Driver visibility is very good due to its high stature and the CRV is very easy to drive. The Honda CRZ is a sporty looking hybrid that possesses quite the punch in terms of performance. Excellent handling and performance coupled with the fact you are reducing your carbon footprint makes for a fantastic driving experience. Interior quality is crisp and classy while the cabin itself is highly refined with little noise making it inside. The Honda Insight is another hybrid hatchback in Honda’s line up. Affordable with cheap running costs, the Insight is a very capable town/city car that wont cost you a penny to tax due to low emissions. Only available with an Automatic gearbox, this car is exceptionally relaxing and easy to drive. The Honda Jazz (AKA Honda Fit) is a sub-compact car that has become very popular in the UK as of late. Attractive, smart looks and low running costs are the main selling point for this Honda and its very easy to drive and live with. This is a perfect first car or city runner.